Happy New Year! I'm working on a new historical fiction called Love With a Familiar Stranger - Rebeckah's Hope. Visit my fan page for more information Facebook.com/annmariesartorauthor. Ned Ellion has it all. He’s at the top of the business world. He has family and friends he cherishes, and a beautiful wife he adores. He lives the literal lifestyle of the rich and famous. Little does he know that catastrophe lurks right around the corner, and his life and all he holds dear will be threatened and tested again and again. 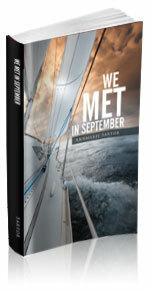 We Met in September is a riveting story of love, loss and hope chronicling the rise to success and disappearance of international sailing magnet Ned Ellion. As her world spins out of control, Kathryn Chambers Ellion embarks on a frantic search for her missing husband, answers to impossible questions, and the touch of magic that only true love can inspire. Annmarie Sartor is the author of the series, Alexis Marsh’s Search For The Truth. Filled with mystery, drama, suspense and intense emotions, these book will surely leave readers absolutely engrossed and wanting for more.